Nike follows the viral rule book: Blue Lobster SB Dunk? Nike usually does some impressive work across the board. This time around, it’s no different. 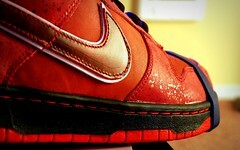 Last summer, the original Concepts Lobster Dunk made quite a splash, without quite this much Nike/Concepts hype. While a cool concept (no pun intended), it seems a bit overhyped, a bit over-viraled, if you will. And to go from first viral leak to final announcement of the shoe drop in less than 2 weeks feels a bit rushed. They’re still releasing viral concept videos after already announcing the shoe… just seems a bit rushed and not fully put together. The blog is just a simple wordpress blog (not that there’s anything wrong with that… just look at this blog) and a few clicks lead to logos of both the skateshop and Nike SB. Not that I’m not looking forward to the shoe… it should be an interesting drop. It just seems like a ton of faux viral hype that doesn’t really do all that much. Viral is definitely being pushed, and evolving. or at least being utilized more frequently. evolution may be questionable. And full detail on the shoe over at real Concepts blog. In what is dubbed a “collaborative student project,” pro photographer and pro blogger Chase Jarvis spearheaded this little creative project at Gulf Photo Plus in Dubai. You can read many more details at Chase’s website… but for now, enjoy what is an interesting amalgamation of photo, video, music, parkour, and creativity. Sometimes spur of the moment creation can yield some amazing product. cool stuff on a surprisingly precipitative tuesday in the northwest. In case the action of this posting isn’t enough evidence, I have returned from my short vacation and am back in the real world, however real it may be. anyway, I’m sure I will have a good photo or two, and maybe even a bit of ad commentary on the ad microcosm that is Vegas at some point, but until then, I give you this. I wasn’t sold on this campaign previously. but I think this spot is the turning point. Directed by the Acadamy Award-winning Cohen Brothers, this spot for the Reality Coalition is a bit more direct in it’s blatant criticism of the coal industry. which makes it more potent. and in case you’re wondering, The Reality Coalition is a joint project between the Alliance for Climate Protection, the Sierra Club, the National Wildlife Federation, the Natural Resources Defense Council and the League of Conservation Voters. That’s a big list of orgs. to band together. And the Reality Coalition website, This is Reality, continues to improve (with an awesome splash page) and their new blog is equally impressive. Socially responsible advertising at it’s best. I wrote about the new pepsi logo a while back, and expressed uncertainty. Well, others have taken it further than uncertainty. I’m digging this in an oddly uncomfortable way. The image is from San Francisco artist Lawrence Yang. Check out his impressive work at suckatlife.com, and his blog is at blowatlife.blogspot.com. It’s always cool when (good) artists get inadvertently thrust into the spotlight… and their work gets more exposure. Cool stuff. Via the always interesting BlackBunneh.